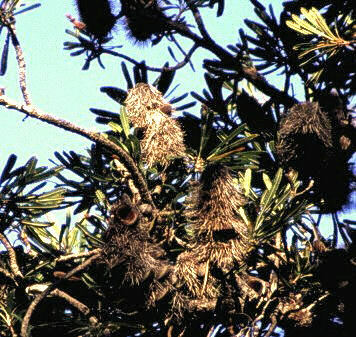 These Banksias grow on Fraser Island and I am not what species they are. As I suppose it's a Saw Banksia (Banksia serrata), but I'm not sure at all. I did not know a thing about them when doing the picture, so I didn't know what to watch out for. Anyway it's very similar and distributed from Fraser island along the coast to Victoria and Tasmania. The picture shows old cones that already released the seeds. The Saw Banksia has an incredible ability to regrow after bush fires. It has underground lignotubers that will survive and sprout again. Also, the heat from the fires will help to open the fruits so the seeds can germninate without competition in the ashes of other plants. A couple of Banksias grow in the area and this picture is not too good. So if you have better information about the species please let us know!